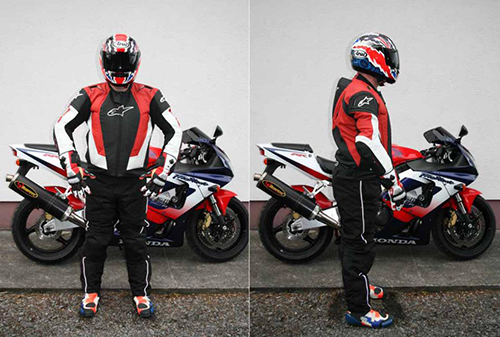 MAG Ireland reports that The RSA (Road Safety Authority) has published a page on it’s web site [click here] about both the EU type approval proposals and it’s own proposal to make high visibility clothing mandatory for riders & pillion passengers. Recently at Right To Ride we wrote to the RSA for further clarification on their proposal for Hi-Viz we have yet to receive a response. Our own Department of the Environment (DOE), Road Safety Branch have said: “There are no plans (or inklings of plans) to introduce a mandatory hi-viz requirement for motorcyclists in Northern Ireland”. We have chased the RSA up for a response. 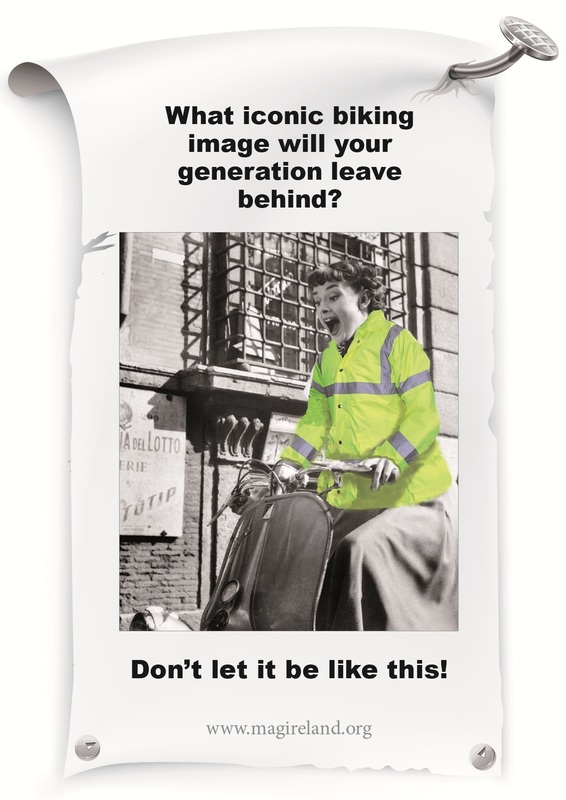 Meanwhile we are just picking up on internet forums and blogs, regarding the introduction in France of mandatory Hi-Viz, that the mandatory wearing of Hi-Viz was apparently proposed to be introduced into law by the 1st September, which has now passed with no such law in place. Off course this does not mean that such a law will not be passed in the future but has the mass national demonstrations by French riders been successful? That is not something the RSA appear to have any intention of doing despite thousands of you demonstrating this past weekend. Why not write to the RSA and tell them what you think as a rider? 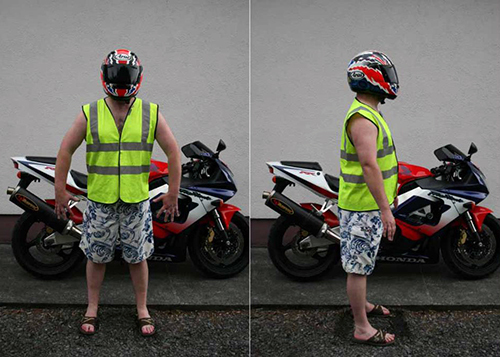 Pictures posted up on the Road Safety Authority Facebook page highlighting the legal requirements if Hi Viz is made complusory in Ireland. Riders in Northern Ireland recognise that personal protective equipment may help to reduce injuries and death. 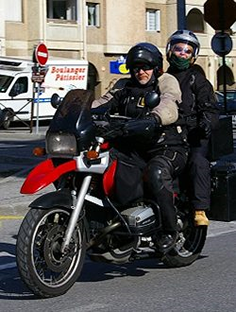 However, in terms of mitigating factors for injuries, the On The Spot (OTS) study carried out in Great Britain on behalf of the Department for Transport, (Feb. 2008) reports that protective clothing including helmets had no effect on the severity of the injuries incurred by riders. The Northern Ireland motorcycling community is safety conscious and riders have purchased protective clothing worth hundreds of thousands of pounds, therefore the use of personal protective equipment should not be made compulsory. 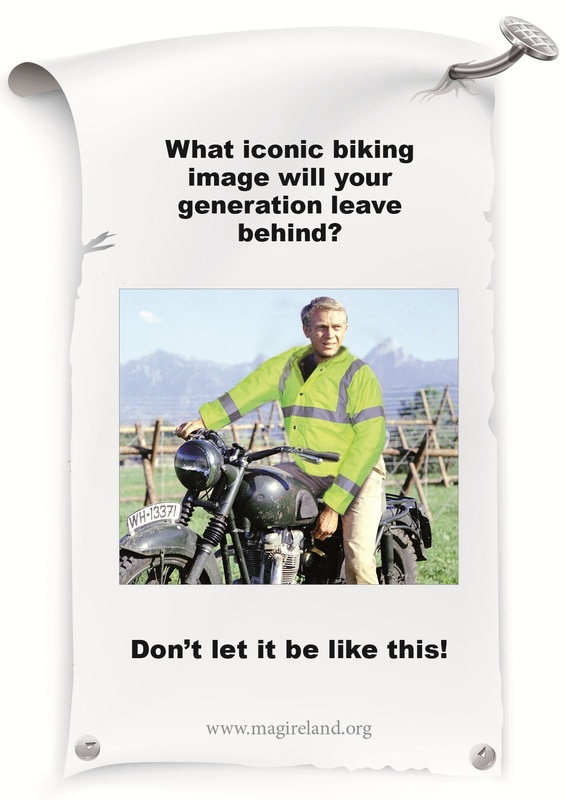 In fact the response to a questionnaire by BikeSafe Northern Ireland, demonstrates that the overwhelming majority of motorcyclists use correct protective clothing. There is some confusion with regards to the standards for protective clothing. The European Standards for protective clothing set minimum levels for various characteristics that should ensure that all clothing which claims to conform to the standards will provide a reasonable level of protection. Clothing, gloves and boots which are subjected to testing and carry an independent and recognisable mark of reliability are a less risky purchase than unmarked clothing. • Non-protective. Outer clothing which constitute a barrier to the elements: heat, cold, wind and rain. Claims for any other form of protection breach the PPE Regulations, UK law, and industry and riders’ groups’ agreements with the European Commission. • Non-protective supplied with CE impact protectors. A non-protective outer garment, as above, fitted with for example accredited shoulder, elbow, knee and back protectors bearing CE marking. • Protective. Jackets, trousers, one-piece or two-piece suits, boots and gloves which are claimed by the manufacturer to be protective. Tested according to the European Standard (or the Cambridge or SATRA standards) and bearing CE marking. 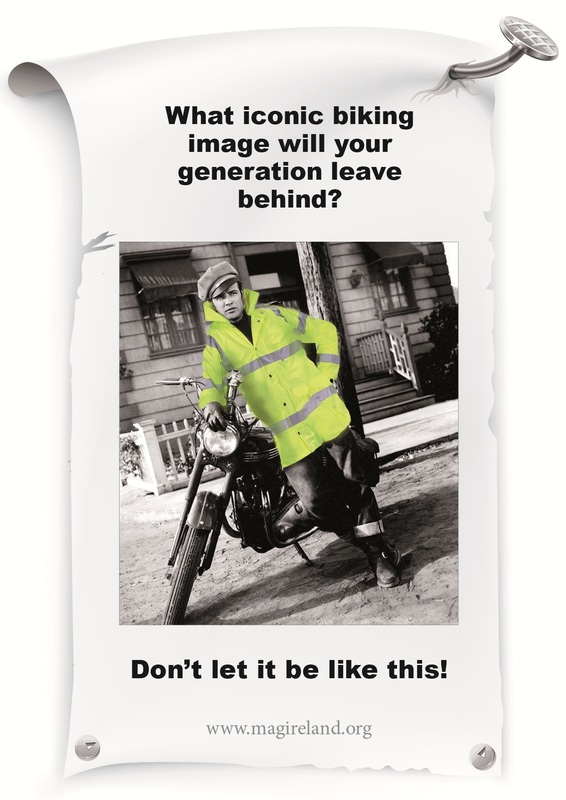 To me these high viz jackets will only be a danger as they will restrict movement on the bike, the reason we wear leather suits is for our protection to add more layers on top of this is very dangerous. Can you imagine on a very hot day the rider will leave off leather protection to put on this heavy plastic type jacket. If anything make lighting up at all times mandatory. See below for text and video link to an Irish MEP speaking in the European Parliament and referencing the demo rides held on the 25th September. then go ahead and write to them yourself. Mairead McGuinness (PPE). – Mr President, this is a very positive report. It is interesting that we are debating it following the protests over the weekend by European Union motorcyclists. Many came out in protest – certainly in Ireland and in other Member States – over what we would describe as positive initiatives regarding road safety for that particular sector of the commuting community. 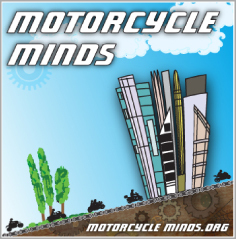 It is interesting to note that, in Ireland, a motorcyclist is 12 times more likely to be killed than any other road user. There is clearly a problem in relation to the safety of this section of road users. I think we should try to work better with stakeholders, so that we do not have protests over something which we believe is important for overall road safety. Some of the issues that were raised by the protestors some may not be true, but we can address others when we move forward. Let us involve those that we are trying to legislate for. A friend of mine was riding down the M1 the other day wearing a hi vis vest donated by bikesafe. The sun was shining and due to the reflection from the hi vi vest he could not see any of the dials on his bike. Sounds like a safety issue.